Facelift Access Hire has been helping out with preparations for the Royal Wedding tomorrow, we have worked with a number of contractors on a range of tasks including providing a 34 metre and 61 metre for filming work on the big day. 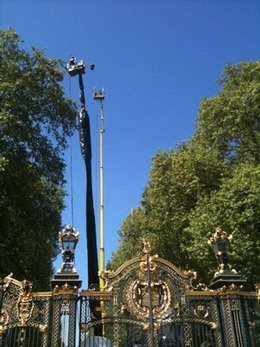 The machines are set up at Canada Gate just outside Buckingham Palace. One of the platforms, a Bronto 34m is seen with black netting cladding to the boom to ensure they have a discreet presence. The cage is mounted with three ‘Hot Head’ remote control camera’s to give coverage to Sky BSB News, BBC News and ITN News. The 61m has been fitted with satellite communication equipment, Helicopter link-up devices and microphones to record the sounds of the day outside Buckingham Palace.